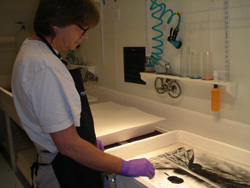 "Make, don't take, beautiful photographs"
Darkroom classes are not being offrered at this time. The essentials and practice of the Zone System of exposure and development. Proper usage of filters. Development of 35mm (135), 120, and large format black & white films. Print beautiful gelatin silver enlargements from 8"x10" to 20"x24". Fine art print presentation technique, including dry mounting.